Some of the fast boyz at the top of Elverton, including Nifty Champ Eric Chodoroff, third from left in yellow jersey/blue shorts. Photo courtesy Jim Frink. Great day on the Nifty Ten Fifty today! A small crowd, only about 20 riders, the smallest field probably since the first few editions beginning 18 years ago. This was entirely my fault — I didn't schedule the ride until a week before, and I changed the date to the end of March vs. the normal, always, forever, never changing, scheduling for the first weekend in April. A number of riders who would normally participate, were racing at Chico Stage Race this weekend. 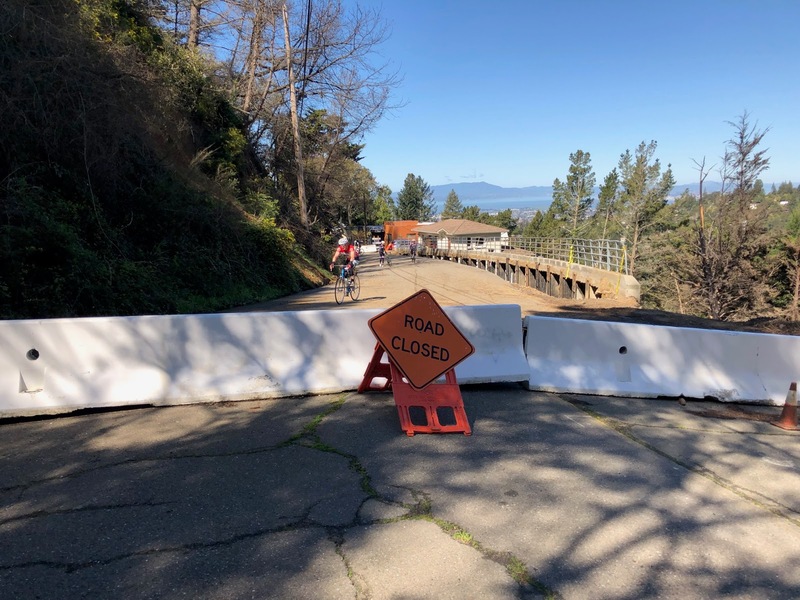 There were several road closures along the route, but riders were not deterred, all were passable by one method or another. But with that said, it was a small group, but a very fine group. The smaller group allowed most riders to decide between the front group, or my slower group, bringing up the rear. Both groups made an effort to stay together throughout the ride, regrouping at the top of each climb. And several riders switched between groups along the way. 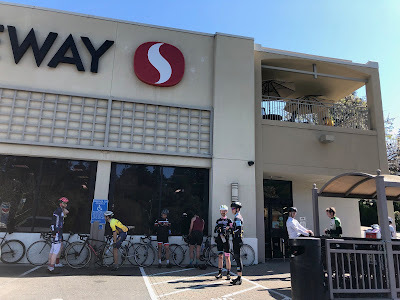 There was one "official" stop along the way, the Safeway in Montclair. I was pleased to find the front group there, when my group arrived a bit later. In the past, some riders have skipped this social break, in favor of getting to the finish in an overly focused, and less social, manner. 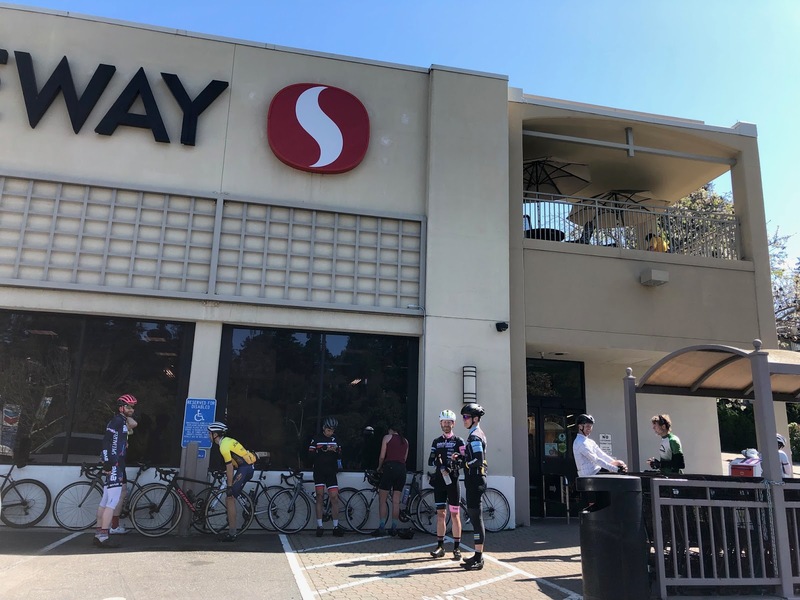 The group takes a break at Safeway in Montclair. Sarah Schroer at the top of Elverton with great bay views. Jay Wood behind. 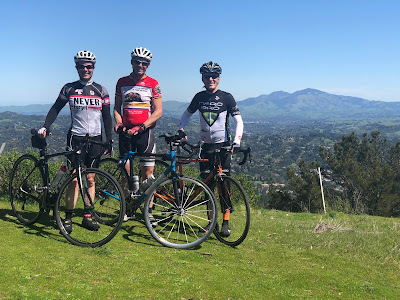 We had three "KOM" climbs on the ride as usual, Marin, Thorndale, and Claremont/Grizzly/Vollmer. Nifty Vet Eric Chodoroff was able to clinch all three climbs, convincingly, other than the last one. Turns out Chodoroff overcooked a muddy, wet corner on the steep hiking path up to Vollmer. He took a tumble, and when his cohorts, at that time minutes behind him, came along, they apparently stopped to help rather than take the opportunity to deprive him of his perfect climbing record on the ride. 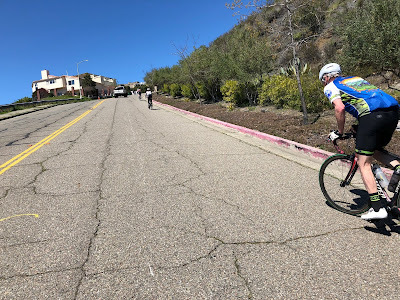 It would be virtually impossible for most riders to carry too much speed on that uphill corner, but Chodoroff's climbing prowess seemed to work against him here. Also, I think the ride organizer asked all riders to take it easy and be courteous to hikers along the path by keeping the speed down. Just sayin'. Chodoroff eventually hauled his carcass back on the bike, and finished one second ahead of Dan Pannell, one of the riders who stopped to help. Fabulous camaraderie, gentlemen! We had only two women on the ride, veteran Sarah Schroer and rookie Ekaterina "Katya" Rakhmatulina. Katya nipped Sarah on the first two climbs, while Sarah was quite a bit quicker on the final push up to Vollmer. Not sure if the 24 year old rookie faded at the end, or whether she had navigation issues, but nonetheless, the KOM awards are based on finishing order/points, and not on time, so Rakhmatulina takes the overall women's win. 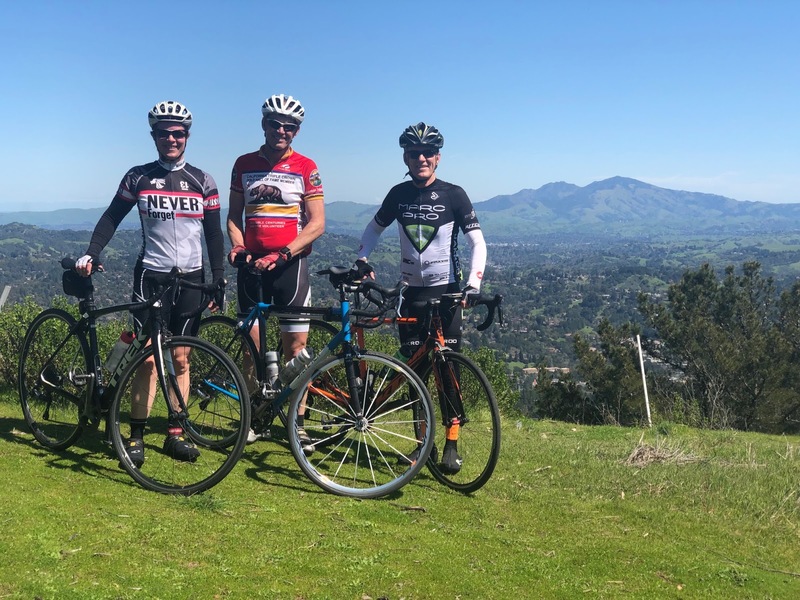 A few Nifty Vets, (l to r) 4x participant, and 2nd place woman, Sarah Schroer, 4x Vet Jim Frink, and 18x Vet, Mr. Nifty himself, at the top of Vollmer Peak with Mt. Diablo behind. Photo by Ekaterina Rakhmatulina. The smaller crowd was in some ways really nice on this 2019 edition, but next year, I will make an effort to schedule the ride earlier, and perhaps return it to the traditional weekend in order that more riders will be able to err... enjoy this sufferfest. A shout out goes to two veteran riders. 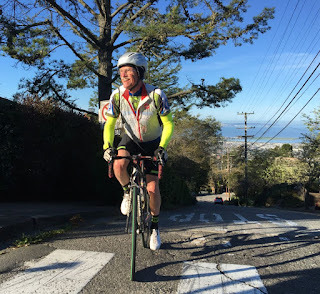 First, Jim Frink, who first did the ride in 2008, and came back for two more editions in 2009, and 2011. 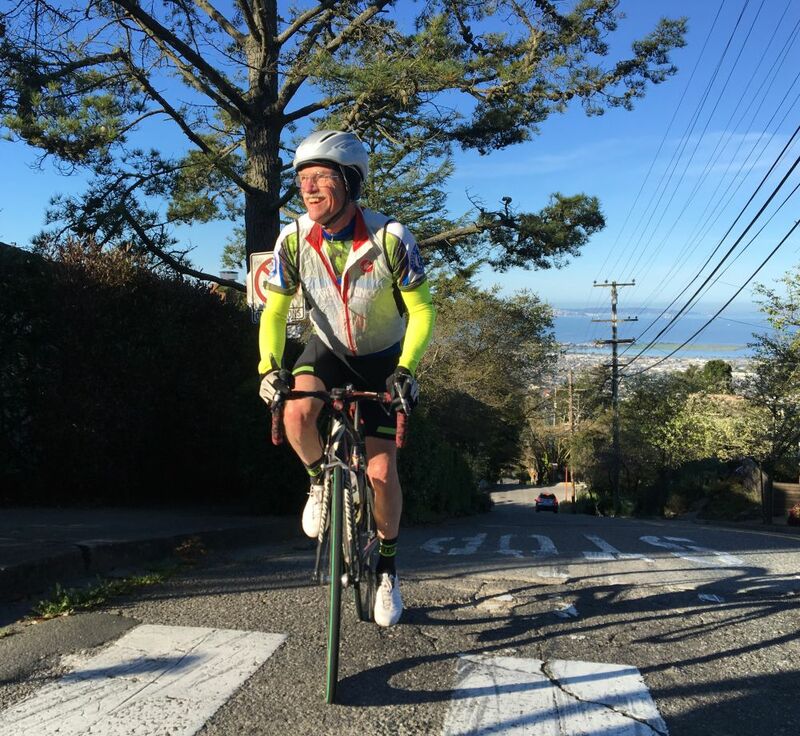 After an eight year hiatus, Jim returned for this year's edition, his fourth time around the course, and rode very strong. Secondly, to Jay Wood, who claims the Lanterne Rouge award, though he was not last on every climb. At 64, Jay is the same age as Mr. Nifty himself, so I can relate to how difficult this ride is with aging legs. Congrats, Jay! One final shout out to Gilberto Flores, who, according to his sign-in waiver is 69 years old. Gilberto rode strong all day, and if you look at the age/gender compensated results below, he "won" Claremont/Grizzly/Vollmer. Interesting note on the age/gender compensation. 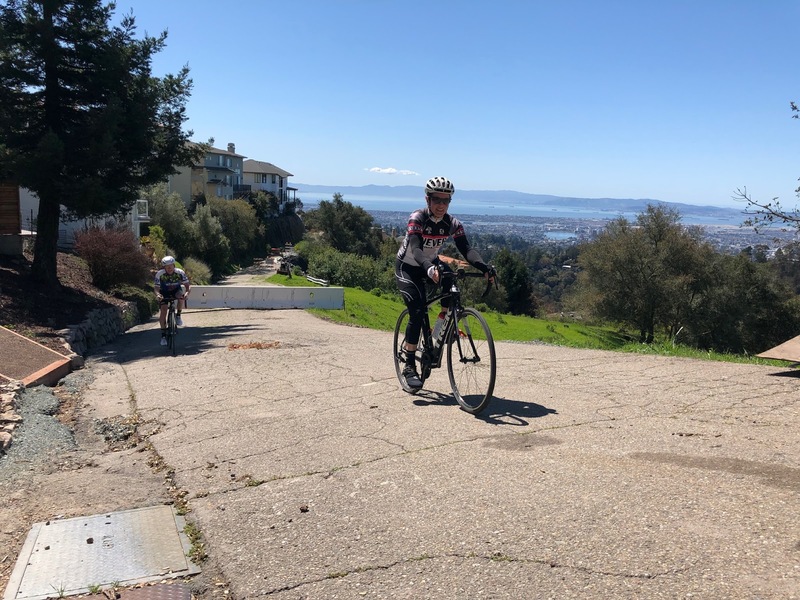 The female riders and older riders didn't seem to benefit much from the time adjustment on Marin Ave, early in the game, but seemed to place much higher in the later climbs. It may just be that Marin is a young man's game! Jay Wood brings up the rear on the brutal Hiller climb, in excess of 20%. Well not exactly the rear, the photographer is actually last! Eric would have been a few minutes ahead on the final climb (he was flying), except he had a minor fall on a wet corner and the rest of us were able to catch up. Thanks Dan for your correction. Eric also sent me a note to that effect, and I will update my comments in the final write up. Great job out there, and congrats on your second place finish!